Caskey-Beazley, Attic Vase Paintings (MFA), no. 171. Interior: The abduction of Deianara from her husband Heracles by the centaur Nessos. Inscribed names accompany the figures (see inscription module). In the exergue, the signatures of the potter ‘Erginos made it’ (EPGINOS) and painter ‘Aristopanes painted it’ (ARISTOPH[AN]ES) appear in BG. Exterior: Battle of Centaurs and Lapiths Figures. Inscribed names accompany the figures (see inscription module). 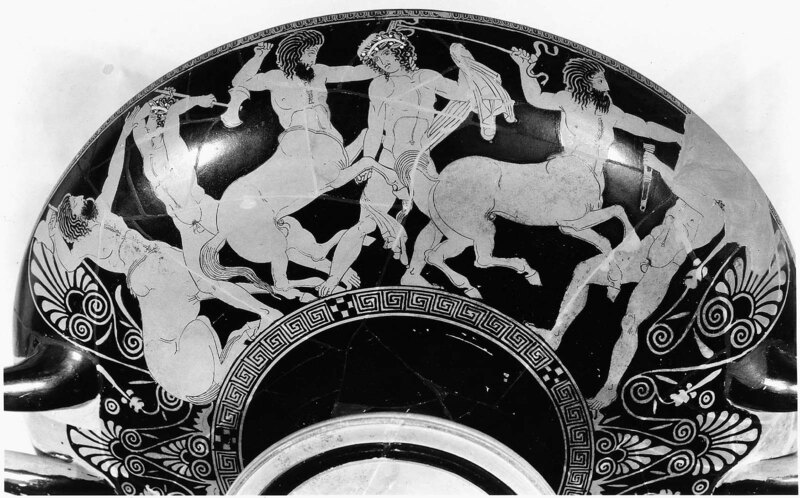 On the interior of this kylix is a scene from the life of Herakles, the great Greek hero. 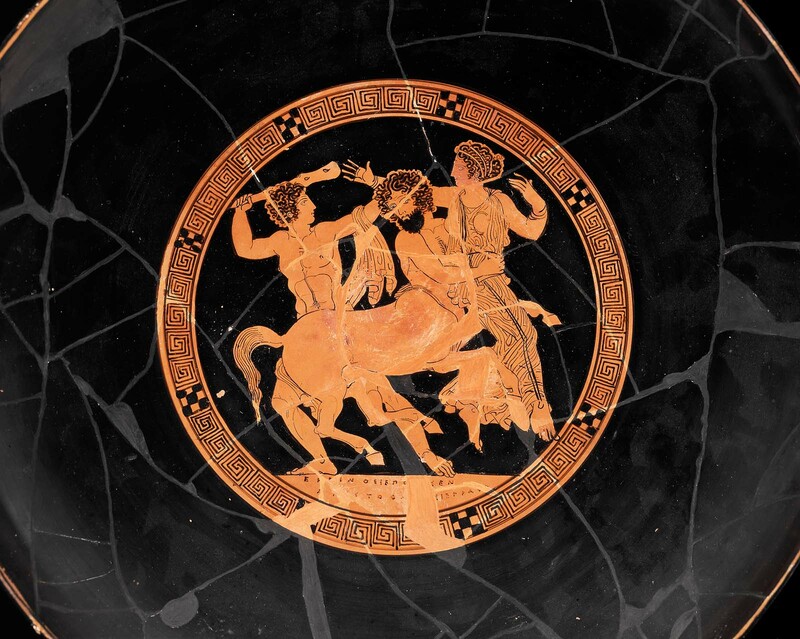 Herakles’ wife, Deianeira, is being abducted by the centaur Nessos. To save his wife from being carried away, Herakles felled Nessos with a poison arrow. 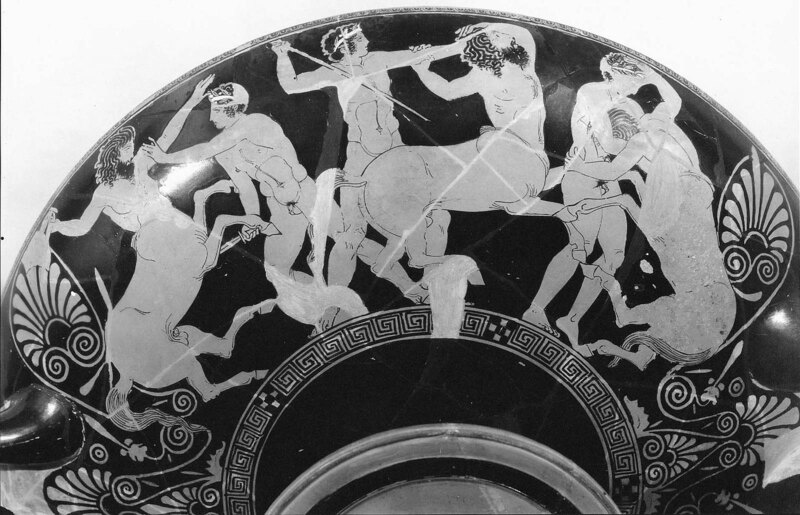 On the exterior of the cup is a popular fifth-century scene showing the battle between the Centaurs and the Lapith family. This vase was signed by both the potter and the painter.